There can be confusion regarding the dating of Rover bicycles, because new information came to light since the ‘A History of Rover Cycles’ book was published in the 1998. Nevertheless, the age of early machines such as this can be ascertained easily enough by the wording on their head badges. The company became The Rover Cycle Co Ltd in 1896, fitting this headbadge from that year onwards. It changed to The Rover Co Ltd on 25th October 1905, so this machine would have been made earlier than that date. Prior to this time, Rover handlebars had inverted brake levers; the company offered the new roller brake levers from 1905 or 1906 onwards. You can see that they are the same as fitted to the 1899 Ladies’ Rover illustrated above. 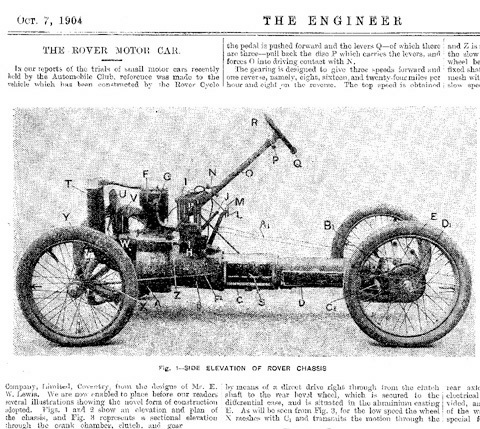 (The catalogue description changed from Ladies Rover to Lady’s Rover in 1905). The price in 1905 was ten guineas (£10 10/-), equivalent to around £1100 today. Having recently been mechanically overhauled, this Lady’s Rover is in good condition throughout and ready to ride. It was repainted at some time during its life, but retains its box lining on the front forks. Below: Two distinguishing features of Rover cycles that are easy to spot are the unique style of bridge between the two tubes of the loopframe, and the Rover chainwheel. Rover was a leading cycle manufacturer in the early years of the 20th century, and started motorcycle production in 1902. Between 1903 and 1924 they made over 10,000 motorcycles. The company temporarily stopped production of the Rover Motor-Bicycle in 1904 to focus on the introduction of their new Rover 8hp automobile. Bicycles had already achieved more or less their optimum design specifications by the beginning of the twentieth century. But cars, of course, were only just beginning. In 1904 the Rover Cycle Co brought out their first motor car.